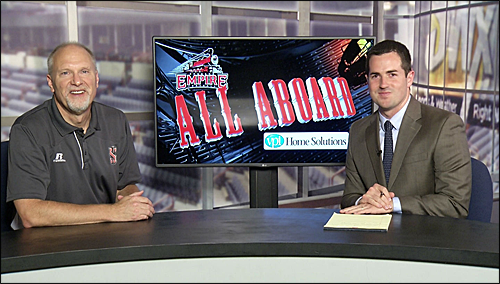 Sports Coast to Coast is honored to have an interview with Larry Weir, best known as "The Voice of the Eagles" for Eastern Washington University athletics as well as "The Voice of the Empire" for the Indoor Football League's Spokane Empire. Weir has been a fixture for sports in the Inland Northwest since becoming the primary play-by-play announcer for EWU in 1991. In addition to his play-by-play duties for EWU football, he also is the main play-by-play for EWU men’s basketball. During the school term, he also hosts weekly football and men’s basketball coaches shows that air on 700-AM ESPN. He also produces/hosts “Eagle Minute” segments that air during the day on 700 ESPN, which cover news and results regarding EWU athletics, including football, men’s & women’s basketball, track & field, and volleyball. 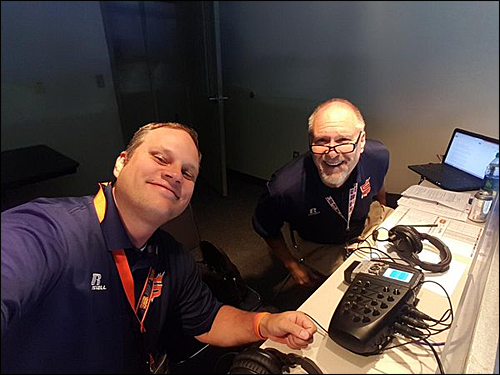 In addition to his Eagles duties, Weir is also the play-by-play for the Spokane Empire (formerly Shock) as well as host of the Empire Coach’s Show during the IFL season. According to the EWU Athletics website, he also works various sport segments for SWX TV and has had stints in minor league baseball, including the Spokane Indians and Yakima Bears of the Northwest League. 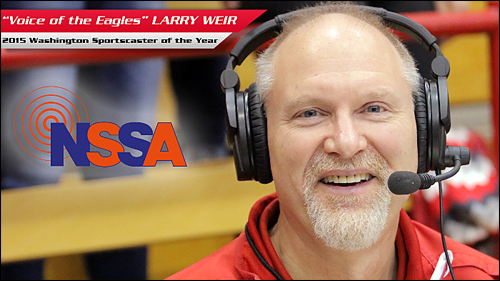 In recognition for his outstanding work, Weir has been the recipient of the National Sportscasters and Sportswriters Association Sportscaster of the Year for the state of Washington in 2014 and 2015. After his coverage of the Spokane Empire in the IFL’s United Bowl title game, I reached out to Larry for an interview request, which he kindly agreed to. Here is the result of our e-mail chat. Not one word has been omitted from the interview. David Hein: Tell us a little bit about yourself. Where do you hail from? Larry Weir: Born in Walla Walla, Wa. and was raised on a wheat farm and cattle ranch in Waitsburg, Wa., a small farming community (around 1,000 population) 20 miles outside of Walla Walla. Only child. Learned the value of hard work and also that I didn't want to farm for a living! D.H.: Did you play any sports in your youth? L.W. : Played basketball and baseball primarily. Played two years of high school football, but had knee surgery and didn't play my last two years. D.H.: Where did you attend college? L.W. : Walla Walla Community College, then to EWU, but didn't finish my bachelors degree. I tell young people all the time to get their degree. Big mistake on my part. D.H.: How long have you been involved in sports broadcasting? L.W. : Since 1980. First games I broadcast were a tribal basketball tournament in Wapato, Wa. My uncle lived across the street from the guy who owned the radio station in Toppenish, Wa. They were talking one day and the radio station owner mentioned to my uncle that he didn't have anyone to do the tournament semi-finals and final. My uncle mentioned that his nephew wanted to broadcast games and so I got hired to come over for those games and at the end of the tournament, got an offer to come back for the high school football and basketball seasons. D.H.: What made you want to become a sports broadcaster? D.H.: Who do you credit as your inspiration for becoming a play-by-play broadcaster? L.W. : Bob Robertson was the Washington State U. play-by-play broadcaster when I was growing up. I listened to all the WSU football games and as many of the basketball games that I could hear. It was tough sometimes to pick up a radio signal at night for the basketball games. Bob did such a good job describing the action and when I started, I just tried to do the game like I thought Bob would have done it. D.H.: What was your first broadcasting job? L.W. : Toppenish and Wapato high school football and basketball games, plus I would pull disc jockey shifts on Saturday and Sundays to earn a little extra money for coming over to do the games. It was about a 250 mile round-trip drive to Toppenish from Walla Walla. D.H.: What do you enjoy the most about your profession? L.W. : Getting paid to watch games and talk about them! Also the interaction with players, coaches, fans and administrators. It's been fantastic to meet so many great people. 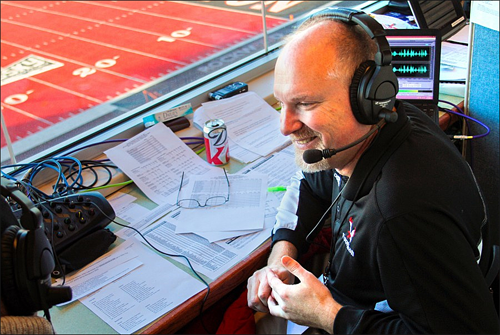 D.H.: How did you end up becoming the main play-by-play for EWU football? L.W. : Rich Waltz, who now does TV play-by-play for the Florida Marlins, did EWU games prior to my taking over in 1991. I believe Rich got a job where he couldn't continue with EWU and I was hired for football and men's basketball starting in the fall of '91. D.H.: Of all the games you’ve covered, is there a game stands out the most to you as the greatest/most memorable? L.W. : Don't know if I can pick just one...2010 Division 1 FCS championship win over Delaware was pretty special, as it was a national championship. EWU's 2013 football win over Oregon State would be up there too, as would both of EWU's appearances in the NCAA men's basketball tournament in 2004 and 2015. D.H.: In your time as the voice of the Eagles, who is one player that has really stood out to you? L.W. : Again, don't know if I can pick just one...Rodney Stuckey and Tyler Harvey both stick out for basketball as they were both NBA draft choices, but there have been a lot of other players who have been great fun to watch. And football...Cooper Kupp, Vernon Adams, Taiwan Jones, J.C. Sherritt, Matt Johnson, Erik Meyer...and the list goes on. D.H.: Have you keep in touch with any former Eagle players? L.W. : Keep in touch with quite a few former players and coaches, either in person or through social media. Usually see quite a few of them over the course of football or basketball seasons. That's been a lot of fun for me over the years. D.H.: You also serve as the voice of EWU basketball. How long have you been doing that? L.W. : I've done basketball every year but two since the 1991-92 season, missing only 2009-2010 and 2010-11. D.H.: In addition to covering EWU, you currently cover Spokane Empire games and the Coach’s Show. How long have you been the voice of the Spokane Shock/Spokane Empire organization? L.W. : I did the Shock games in the af2 days from 2006-2009, then joined back up for the 2014 and 2015 seasons. D.H.: How difficult has it been this year not referring to the Empire as the Shock? L.W. : It was really hard early in the season, but by the end of the year it was pretty much second-nature to say Empire. But there were still a few slip-ups here and there! D.H.: You’ve said on broadcasts you’ve enjoyed the IFL game over the AFL. What exactly do you enjoy more about the game of Indoor Football? L.W. : I don't think there's any surprise that the team who ran the ball the best in the IFL (Sioux Falls) was the league champion. And that's what I like...the AFL was a passing league and more like watching 7 on 7 drills, whereas the IFL is closer to outdoor football. Linebackers are free to roam and not put in boxes and actual running backs are called on to carry the ball. D.H.: You’ve visited Kennewick, Billings, Sioux Falls, Loveland, Grand Island, and Des Moines this season. What’s been your favorite place to visit? L.W. : Not Grand Island! They all were OK. I didn't have any travel problems this season, so none of the trips were particularly bad. The cities were reasonable with decent hotels and places to eat. If pressed, I might say Des Moines, mainly because the broadcast position was the best of any of the road arenas. D.H.: Which Empire player have you enjoyed watching play this season? L.W. : Again, hard to single out one player...I've enjoyed watching and getting to know some about all of the guys. A great group of young men with high character. But there's no doubt Trevor Kennedy was the best offensive player in the league and I hope he gets a chance with a team where he can get paid more money to play football. He's a great talent. And nobody played harder than Robert Brown. He's not the biggest guy on the field, but no one puts more heart into playing that he does. I hate to single guys out because I could go down the roster and talk about every one of these players. It's just been a joy and I'm fortunate to have been able to see this team play. D.H.: With the Empire season now over, how would you rate the season as a whole and what do you expect in 2017? L.W. : I don't see how this season can be rated as anything but a success! Spokane wasn't the typical expansion franchise because of the history of the Shock and because of Shack's success as a head coach, but this was still a first-year team in the league and didn't have a track record. They do now and I'm excited to see what happens next year. D.H.: Tell us one thing about yourself that people may not know. L.W. : One thing that someone encouraged me to talk about many years ago and I never have is the fact that I was diagnosed with being dyslexic when I was 6 years old. I've never had a problem reading or spelling, but have had a problem with balance, coordination and being able to tell left from right. Which really isn't dyslexia. But dyslexia is related to dyspraxia, which does cover my problems. So I tend to believe I'm dyspraxic rather than dyslexic. I suppose in the late 1960's in a rural area, I was lucky they figured out there was any kind of a problem. If you are able to watch a game I'm broadcasting on radio, you might notice from time to time that I get confused on left or right...I did it on Spokane's 1st TD vs. Sioux Falls on Saturday. Called the TD pass thrown to JJ Hayes as being to the left side when it was actually to the right. Guess now is as good a time as any to share this and then say that if a person has a factor that is limiting to them, just keep plugging away and figure out how to get around or work within whatever the affliction may be. Adapting to the situation around us is a great skill to develop. I'd like to thank Larry for being kind to take some time to answer my questions. You're a pleasure to interact with. 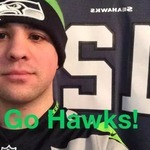 If you're a fan of Eastern Washington athletics or the Spokane Empire, be sure to follow Larry on Twitter at Twitter.com/LarryWeirPBP. It's great to get to know him a little better. I'm really surprised at how candid he was in that last answer. It seems like something very personal. Thank you to Larry for that. Thanks, David, for presenting this interview. This has been truly inspiring! I agree! I knew some things beforehand, but there were a lot of other things that I did not know, including the last answer. I agree with you, it was very personal, yet very insightful. I was surprised how candid he was about that, but it made me respect him that much more for admitting that. A very interesting individual, indeed.